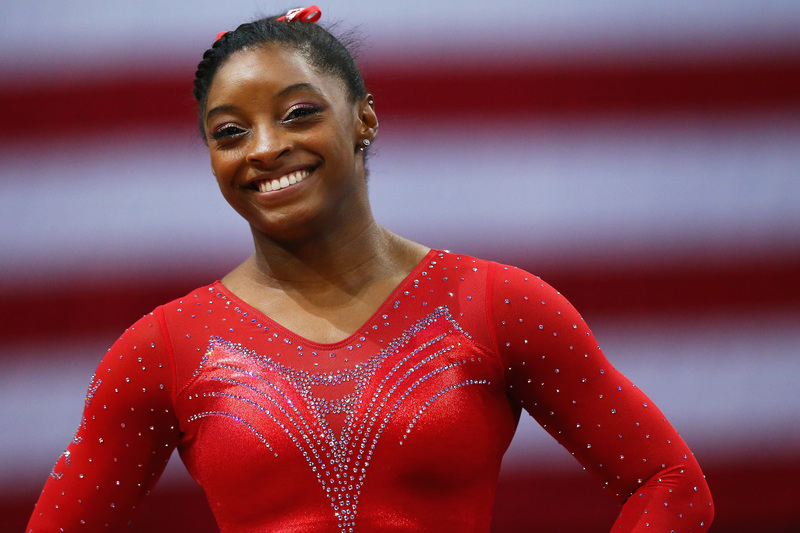 If by some slim chance you don't know the name Simone Biles yet, well, you soon will. In fact, it's a pretty safe assumption the 19-year-old gymnast will be a household name when the 2016 Rio de Janeiro Olympics roll around this summer. And these Simone Biles quotes prove she is just as captivating when she isn't mid-maneuver — although she's undeniably inspirational on the mat (or beam, or any other gymnastic platform she's mastered), too. Watching Biles compete is like watching poetry in motion — her body is lyrical in movement, and those movements are full of resonance. And while the facts that she has won three straight world titles and hasn't lost the all-around category at a meet since March 2013 are impressive enough on their own, it's even more impactful when you consider the journey that brought her to this point. Biles' mother struggled with substance abuse on and off, and as a result, Biles herself spent time in the foster system at an early age before being adopted by her grandparents in Houston at the age of 3. She discovered gymnastics by accident at age 6 (a coach spotted her copying gymnasts on a daycare field trip) — and the rest, as they say, is history. Today, she is the first African-American person to be a world all-around champion and only the second woman in history to win three consecutive world titles. In other words, this girl is on fire. Get to know her better before she dominates at the Summer Olympics in August by reading some of her refreshingly relatable yet aspirational quotes. 1. "If you're having fun, that's when the best memories are built." Someone put this on a T-shirt and fast! Biles gave this little gem during an interview with Refinery 29 and, I have to say, the fact that Biles is in such a competitive field but still understands the importance of having fun bodes well for the longevity of her career. It's hard to burn out when you find the joy in everything you do. 2. "I was missing out on public school and going to the football games, prom or homecomings. But I've been to three World Championships ... so I think it's like a win-win." Truer words were never spoken, girl. Trust me — I went to all of those things and, while they were a blast, they sure weren't World Championships. The only record I broke in high school was how many times one person can miss homeroom without getting expelled. 3. "I take things one step at a time." During a cover story for Teen Vogue, Biles underscored the importance of not letting the pressure of upcoming competitions get to her. Like, oh you know, the Summer Olympics, for example. And, real talk, this is great advice for anyone not matter what you do. 4. "A successful competition for me is always going out there and putting 100 percent into whatever I'm doing." What can I say? The girl gets it. She just does. Biles told USA Today that winning isn't everything, and perhaps the fact that Biles embraces this ideology has something to do with the fact she is always excelling. For her, the definition of failing is simply not trying her hardest. 5. "I was built this way for a reason, so I'm going to use it." Speaking to Refinery 29, Biles admitted that she used to be self-conscious about the fact her build is different than many gymnasts. However, she has since learned that what makes her unique also makes her strong. That kind of body positivity in a teenage girl is something the world sorely needs more of. 6. "I'd rather regret the risks that didn't work out than the chances I didn't take at all." While Biles lives a life unlike many girls her age, she is ultimately a teen girl just like any of her other peers — which naturally means she spends a lot of time on social media. But if she keeps tweeting out words of wisdom like this, here's hoping she starts a Twitter-storm of empowerment. 7. "I plan on doing things that I can't do because of gym right now. ... Things like going swimming with sharks or jumping off a cliff into water." Ah, a girl after my own heart! How can you not love that Biles spends 32 hours a week honing her gymnastics skills and then wants to turn around during her downtime and go cliff-diving? She apparently only has one speed, and that is full throttle. 8. "To go out there and prove what I can do has taught me a lot about who I am." The greatest athletes are the ones who transcend their athletic ability because they possess an equally captivating quality of character — and the hallmark of that kind of athlete is that is constant introspection and trying to grow his or herself as a person. Biles clearly has that. 9. "I wasn't born earlier, so I had no say in that!" This was Biles' response to Reuters when asked why she thought no one had won back-to-back world and Olympic all-around titles since 1996. Can you say perfection? Biles is an irristible blend of naturally humble but unfailingly confident in her own gusto. 10. "We can push ourselves further. We always have more to give." 11. "It's inspiring to young athletes that there are more records that can still be broken." Dear whoever keeps saying young people are slackers, please take all the seats. These words by Biles are a shining example of the kind of determination and reach young people today possess but rarely get credit for having. 12. "The team comes first." For me, personally, this is what saving the best for last looks like. Anyone who has ever competed in team sports knows that a true leader in any given sport is the person who always puts the needs of the team before their own. Despite being such an inspiration to, well, everyone, Biles remains in awe of her teammates, saying, "They always motivate me."